Nāropa or Nadapada or Abhayakirti (Tib. ནཱ་རོ་པ་) (956-1040) was an important master in the Kagyü tradition. 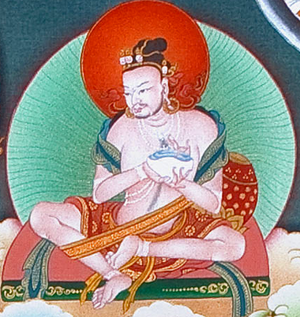 He was a disciple of the mahasiddha Tilopa and a teacher of Marpa the translator and many others. He is also counted among the eighty-four mahasiddhas. ↑ Peter Roberts gives Naropa's dates as 956-1040, and explains that the common dating of 1016-1100 is based on a literal reading of Tsangnyön Heruka's account of the life of Marpa, including visionary accounts without historical basis. See Mahamudra and Related Instructions, p. 14. This page was last edited on 24 March 2017, at 20:05.